Robert White portrait of George Herbert painted 41 years after his death. 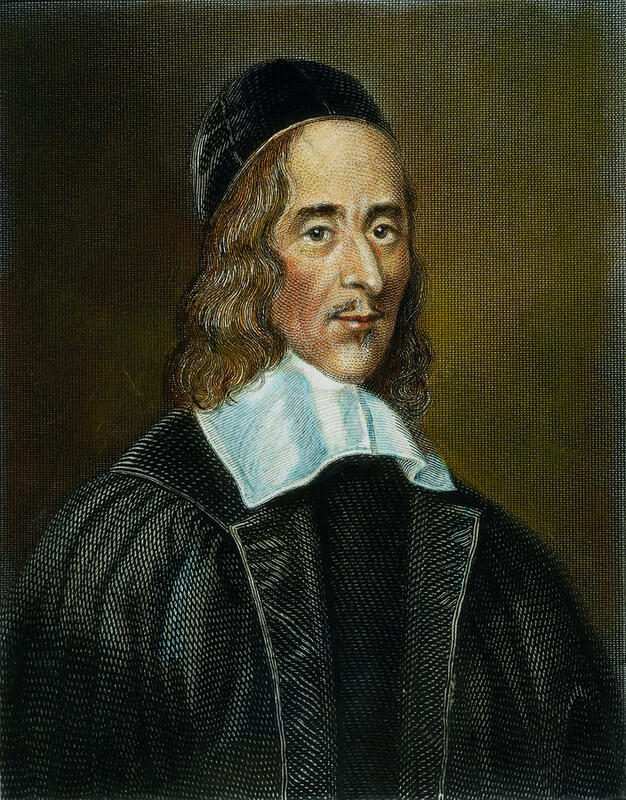 Today is the feast day of George Herbert, the seventeenth-century Anglican poet and priest whose remarkable verse was inseparable from his prayer life. As one admirer put it, “Herbert wrote most of it, but God wrote quite a lot.” That’s a proportionality to which every creative, and every priest, might aspire. The “holy Mr. Herbert,” they called him around his parish. It was a term of affection. In his late thirties he had given up worldly ambitions to enter the priesthood, and he spent the rest of his life at a country parish in the English village of Bemerton. He died of consumption only four years after being ordained. But his famous manual of advice to country parsons proved a lasting legacy, shaping the self-understanding of clergy for generations to come. Herbert liked puns. It wasn’t just a cleverness with language. It was the way he saw the universe: one thing becomes another, like bread becoming God. He often starts with a word or an image, and morphs it into a multiplicity of resonant meanings, or as one critic put it, “he breaks the host of language.” The one is broken into the many so that all the scattered fragments may one day again be made one when God is all in all. In ‘Church Monuments,’ he’s sitting in church, his mind wandering, and he starts looking at the big marble tombs all around him. First he thinks of his own mortality, “this heap of dust,” but in a few more lines he makes us see the marble monuments themselves crumble into dust, pressing upon us the awareness that everything on this earth must pass away. We are all passing away. And then in one stunning final image, Herbert makes our dust to be the sand in an hourglass, where time is always running out. And in the process he makes a nice pun: “flesh is but the glass” makes the biblically literate reader think of “all flesh is grass,” one of the most vivid evocations of mortality in all of literature. Herbert believed in words. Language was held more dear in his day, and he used it as a ladder to bridge earth and heaven. Grammar itself became a finely tuned instrument of praise. In ‘Prayer I,’ there are almost no verb forms. It’s mostly nouns, conveying a changelessness transcending the busy world of doing: Prayer the Churches banquet, Angels age, Gods breath … The soul in paraphrase, heart in pilgrimage … Engine against th’ Almightie, sinner’s towre, Reversed thunder … Heaven in ordinairie, man well drest … The land of spices, something understood. And in ‘The Call,’ it is nouns that dominate both the stresses and the structure of every verse: Way, Truth, Life … Light, Feast, Strength … Joy, Love, Heart. Some of Herbert’s imagery speaks of humankind misreading or misspelling reality, and it was the poet’s job to put it right, to give everything its proper name once again. When Herbert lay dying, he entrusted his poems to his friend Nicholas Ferrar. They were, he said, “a picture of the many spiritual Conflicts that have passed betwixt God and my soul, before I could subject mine to the will of Jesus my master, in whose service I have found perfect freedom.” As to whether to publish his manuscript, he left that to Ferrar. “If he think it may turn to the advantage of any poor dejected soul, let it be made public; if not, let him burn it.” Thank God for Ferrar’s good judgment! The Herbert whom we meet in his poems is a person very much in process: unfinished, imperfect, always aspiring to something higher. He cared deeply about formation and growth – his own as well as that of his congregation. As poet and priest he used all possible art to move those with ears to hear. Ryme thee to good, and make a bait of pleasure. As the subject of many of his poems, he used his own life, his own wrestling with God, as a lens for examining the frailty of mortals and the workings of grace. And as his own audience, he used the very process of writing as a form of prayer and self-examination. His poems are both the record of a soul and a source of instruction. Herbert was extremely honest – even ruthless – about his prayer life. His mind was a “case full of knives,” as he put it, and he was no stranger to doubt, particularly doubt about traversing the abyss between human frailty and divine glory. He wrestled with God, he wrestled with his own frail and mortal nature. “My searches are my daily bread,” he wrote, “but never prove.” He doesn’t get proof. He gets something better – faith. Perhaps his signature poem is ‘Love III,’ which Simone Weil called “the most beautiful poem in the world.” I often use it to begin the liturgy of Maundy Thursday, with the congregation taking the part of the guest, and a solo voice speaking for Christ the host. In the poem, the guest is full of self-abasement: not worthy to be here, not worthy even to look upon the One who invites him to the feast. And yet, the calmly insistent voice of Love will not be denied. There is nothing the guest can say or do that can ever separate him or her from that Love.